The Myanmar/Burma Indigenous Network for Education (MINE) was launched on Friday 21st February, International Mother language day. An ethnic education seminar hosted by the Karen Teacher Working Group (KTWG) in Mae Sot from 12 – 14 February led to the creation of MINE. The seminar was facilitated by Dr Joseph Lo Bianco, Professor of Language and Literacy Education at the University of Melbourne and a consultant and expert in Language and Peace building. 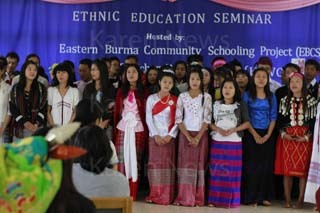 Ethnic education leaders from 22 organisations attended, with 12 different ethnic groups represented. “I am very encouraged by the level of enthusiasm of the group and the cooperation and participation in exploring different ways to preserve and promote our mother tongue languages” said U Ein Daw Par Tha from Naung Taung Parahita Monestary (Hopone).